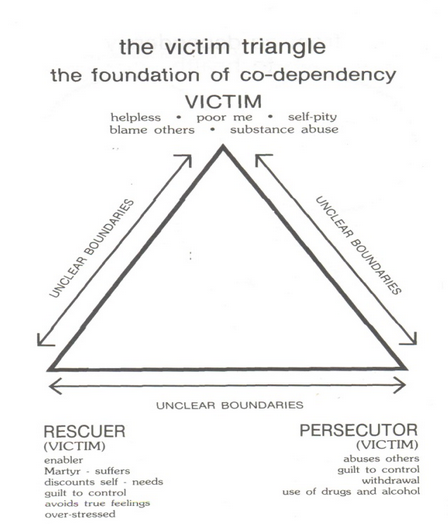 I have been wanting to share the Karpman Drama Triangle with you all ever since my counselor introduced me to it. It has been especially helpful for me in dealing with certain rocky relationships in my life that have never gotten better despite the passing of years. I am not an expert on any of this, but I'm going to share what it means to me and how it has helped me. Take a moment to review the triangle below. There are three roles here, the victim, the persecutor, and the rescuer. As you can see, everyone ends up feeling like the victim in these relationships. It's unhealthy and full of drama, drama, drama. I'm going to give an example of how this might play out and honestly this can play out in SO many ways and in pretty much every situation. Baby cries and the mother begins to do what she believes her baby needs for soothing. A rescuer offers unsolicited advice on what he/she thinks the mother should be doing. The mother feels like a victim because she feels like the rescuer doesn't think that she knows how to comfort her own child. The mother feels sorry for herself because she has to deal with this type of behavior from the rescuer. The mother lashes out and snaps a response, "I think I know how to care for my own child." In turn, the mother now switches from being the victim to being the persecutor. The rescuer now takes on the role of the victim and begins to feel "poor me" type feelings. In this situation, both people involved come away from the situation feeling hurt and resentful of the other person- like victims. Neither feels like he/she is guilty but places the blame on the other person. More than likely, the rescuer has been living out this type of behavior for a long time. They may often try to place guilt on others and are generally negative. And perhaps the victim has also taken on this role for far too long. Most importantly, someone needs to make a change to escape from this dramatic cycle. This can be the hard part and takes humility. The person has to either value the relationship enough, or at least be tired of the negativity enough, to take a stand and make a change. For me, this has been about practicing the Golden Rule- do unto others as you would have them do unto you, and also about setting boundaries firmly but kindly. Setting boundaries can be hard to do because we don't want to offend the other person. However, if we want the negative cycle to stop we have to put our foot down. The important thing is to be kind about it. So in the situation above, the mother could say, "I know you are very concerned because you love baby too, but I am going to try this method of comfort because I know that it works for baby". It is so easy to be snippy when someone annoys us, but if we practice the Golden Rule we can change the cycle. I don't want to go into all of the specifics here, but doing this has definitely helped. It doesn't change the other person necessarily, but it does make me feel better about myself and how I'm acting. I am no longer the victim, rather I am a survivor. I don't feel guilty for my bad behavior. My counselor told me something else that has helped me tremendously in many relationships. Sometimes we encounter people who are just odd, abrupt, rude, and unkind. Instead of feeling like a victim, I have to tell myself that "that's just them" and it is not my fault. I do not need to allow their actions or attitudes (what makes this person "just them") affect me and cause me to be the kind of person that I don't want to be. I am in control of me and I cannot control the actions of others and their actions are not my fault; however, my actions are my responsibility and I have the power to change negativity into positivity, even if the other person continues to be "just them". I'm not sure if all of this makes sense, but it definitely makes sense to me and has been incredibly helpful. This is a great post and I have to be honest that one of the main lessons I have learned in the past year of my life (during my last relationship to be more specific) is that fact that people are who they are and we should never take things personal. My last boyfriend was super rude and would often say offensive things to me and others around him. I think until this day he still doesnt think he has a problem. What I realized? that is who he is. I had to make a decision to either love him just the way he was and accept him being offensive towards me OR I had to let go. It hurt a lot but I realized I loved myself more than I loved him and so I let go. Wow I totally needed this today!!! This is good! I haven't seen this triangle before. I've had to set my own boundaries with a few people in my life; I realized that every time I had contact with them, I came away feeling really crappy and terrible about myself. So, I had to take a step back--fortunately for me, I was always the one initiating contact so I haven't had to worry much about them contacting me. Now, the few times a year that I do talk to them, it's much easier for me to remind myself that it's just how they are and while I can't control them, I can control how I react. Thank you for sharing this! Also, may I ask whop did your blog? I just love the header! But, I already ended up paying someone. Maybe when I reach my goal weight I will reward myself with this !